This is the most delicious ‘bread’ – Sandy’s been making it and its sensational. One can “go savoury” by adding finely diced olives or snipped sun dried tomatoes or simply, say, tarragon….. or “go sweet” by adding finely chopped dates and lemon zest or a small handful of raisins. Substitute the rolled oats with spelt flakes and one table spoon of raw honey. I might make it again using olives as it was the texture I did not enjoy and maybe with a few soft morsels to break up the nuts and seeds I will enjoy it more. Blog-checking lines: For the August challenge Susan from The Kiwi Cook dared us to make Seed & Nut Loaf – a super-healthy and gluten-free alternative to standard wheat-based bread. I really like this recipe Tandy. I often buy something quite similar with figs or dates and cut it for a dessert. Yummy! 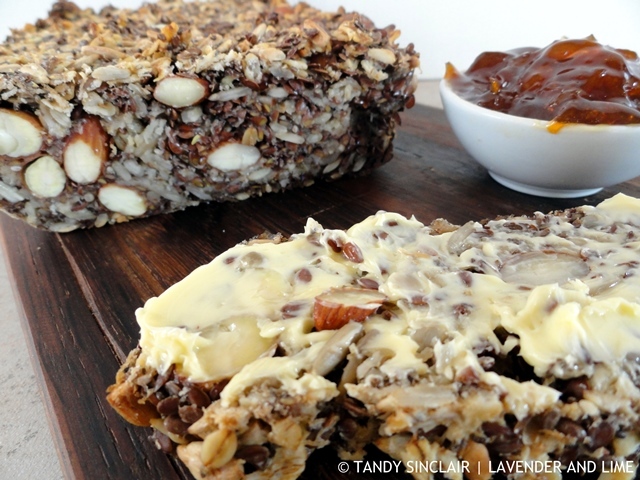 This GF nut and seed loaf looks delicious, Tandy! Sounds divine. I need to make this soon! ? Yummy! It sounds delicious and healthy. I LOVE that the first instruction is to Pray!! This is obviously the recipe for me…. I have always been rubbish at making bread -and that’s clearly why! I’m allergic to gluten so this recipe is absolutely perfect for me! Looooove it !! Have seen this recipe in a few places and have got it on my to try list too – Tandy! Yes, I think olives would be a interesting and delicious addition. This is definitely an interesting “loaf”! I am all for trying something new, especially anything gluten free as my belly seems to not be loving the gluten life recently! I am going to try this, but go for the savory route and add sun dried tomatoes.. because I love them and in my opinion NOTHING can taste bad as long as those are included! 🙂 Cheers to a beautiful weekend, my dear! I deal with emails the same way. And I actually saw the The Life-Changing Loaf of Bread this very week online! Small world. Glad to get your take on it and know the right link now. I would be up for trying it for sure. Thanks for your candor, Tandy – but from that ingredient list, think I might agree with Dave and Nico – I love the sound of this loaf! It’s very nutty and seedy. I liked it but I don’t know if I would make it every week although it was nice to try out. I think your adaptions sound great! How is it in your Neck Of The Woods? It is still stormy and hot hear in ours. This recipes looks amazing. I am a nut fan. I just love a good homemade bread. From the looks of it, it looks like a VERY delicious bread with all the chunks and crunches..Mmmm!! Fabulous loaf Tandy. Would eat way too many slices with copious amounts of butter. awesome! I shouldn’t eat gluten, so the recipe sounds perfect to me!